The quote is from Fr. Michael Augustine, SCJ, rector of the Dehonians’ theology program in the District of India. He was speaking about the first year of the “Adveniat Regnum Tuum Pathway.” The program – a partnership between the district and Sacred Heart Seminary and School of Theology – allows Indian seminarians to earn a master’s degree in theology through a mix of online courses, classwork in India, and on-site classes at SHSST. An unreliable internet is just one of the challenges that Indian students have in pursuing advanced studies. Academic resources are limited in many of the areas where SCJ formation programs are offered, and class sizes at local theological institutes are large. In 2016, Fr. Michael, rector of the theologate in Eluru, had a casual conversation with Fr. Tom Cassidy, SCJ, who was doing an extended visit with the community. Fr. Michael was seeking ideas to help broaden the academic possibilities for his students. Fr. Tom suggested speaking with SHSST to see if one of its instructors could present a course in India during the semester break. But instead of periodic courses, SHSST worked with the district to develop a collaborative master’s program. In February, 2018, Fr. Tom Knoebel, SHSST rector, and Dr. Patrick Russell, SHSST academic dean, went to India to investigate possibilities. A few months later, the master’s program was in place. Fr. Charles Brown, SCJ, assistant professor of Scripture Studies at SHSST, went to India to teach a course on Paul. Among his students were some of the first to take part in the new master’s program. Two to three theology students from of each of the district’s in-coming classes are invited to take part in the MA program. The students begin with online courses prepared by SHSST instructors presented via YouTube videos. Students and instructors interact through the seminary’s Populi interface, email and Skype. Fourteen credits are done online and nine are done locally at Vijnananilayam, an institute of philosophy and theology operated by the Capuchins. Ten credits are taken on-site at SHSST. In January, the first Indian seminarian, Br. Meghanand Bandanadham, SCJ, arrived at SHSST for his on-site coursework. He was to be joined by two classmates, but they have not yet received their student visas. Fr. Michael traveled with Br. Meghanand to both get a first-hand look at SHSST, and to work out details of the newly developing master’s program with faculty and administration. He leaves on January 23. The Indian District has a history of sending its students to different entities for their studies – Fr. 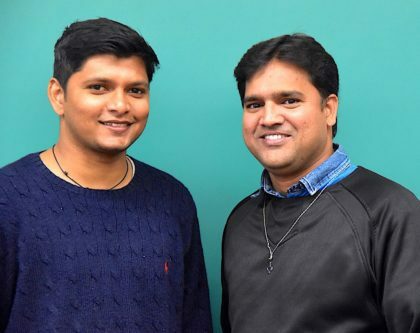 Michael did his licentiate in psychology in Rome – but this is the first time that Indian SCJ seminarians have studied in the United States. That commitment includes funding the satellite internet system at the theologate to address the literal “monkey business” that interfered with online classes. Several SCJs from the US Province have assisted the district, among the Fr. Tom Cassidy, Fr. Jim Schroeder, Br. Leonard Zaworski and Fr. Tom Fix, an American member of the Indonesian Province. “Fr. Tom Garvey was like a father to us,” said Fr. Michael. “Fr. Tom Fix was an example of a saint. In October, the Indian District will commemorate its 25th anniversary. “Of course, members of the US Province will be invited to join us,” he said. One of the dreams of the district at that time is to “pay it forward.” For many years the district has benefited from the generosity of others. Now, Indian SCJs want to move north, to establish a Dehonian mission to serve some of India’s most desperate, those who are on the peripheries of society.